It’s been a satisfying summer of test cricket for Australia, as we convincingly trounced India in all four matches. One nice thing is that we played on January 26, which is not only Australia Day, but also Independence Day in India, so we shared our national days. One of the highlights was team captain Michael Clarke scoring a triple hundred, modestly declaring on 329, just a few runs shy of Don Bradman’s top score of 334. It was the 100th test match to be played at the Sydney Cricket Ground, and Clarke’s score was both the highest ever in an Australia vs India test series, and the highest ever at the SCG. He followed up the triple century with a double century in Adelaide. The name Michael is from Hebrew, and is translated as “who is like God?” – a rhetorical question with the obvious answer of “No-one is like God”. It is therefore a symbol of humility. In the Bible, Michael is an archangel, and very important in both Jewish and Christian traditions. In the Old Testament, he is said to be the protector of Israel, and in the New Testament Michael is the leader of the angelic hosts who defeat Satan in a war in Heaven. Michael is also mentioned in the Koran. Michael is venerated as a saint in the Roman Catholic and Eastern Orthodox faiths; he is a patron of the military and also the sick and suffering. Some Protestant denominations believe he is identical with either Jesus or Adam. He has made a number of apparitions, including, according to legend, at St Michael’s Mount in Cornwall, and Mont Saint Michel in Normandy. Michael has long been popular in Ireland (it’s currently #12 there), and considered to be a typically Catholic name – so much so that Mick is disparaging slang for a Roman Catholic of Irish descent. We also say taking the Mickey or taking the mick, which is Cockney rhyming slang from “Mickey Bliss” ie “taking the piss” (to tease or mock). Michael is a classic name which has never been out of the Top 100. It was #44 in the 1900s, reached its lowest point in the 1920s at #66, peaked in the 1970s at #1, and is currently #38. Unbelievably, as Michael Clarke hit his record-breaking triple century, he had no sponsorship on his bat, having just been dumped by a cash-strapped Dunlop Slazenger. The only markings on his bat were promotional stickers for Jane McGrath Day, or Pink Stumps Day. Jane McGrath was the first wife of former cricket player Glenn McGrath; an English air hostess prior to marriage, she became an Australian citizen on Australia Day 2002. That was the same year she and Glenn founded the McGrath Foundation to raise money for breast cancer. She died in 2008 after battling breast cancer for more than a decade; she was 42 years old. The McGrath Foundation has raised more than $12 million, and the third day of the first test match at the SCG each year is Jane McGrath Day. The stands are filled with tens of thousands of fans wearing pink to show their support, many guys sporting Real Men Wear Pink signs, and over a million dollars is expected to be raised by cricket clubs. Jane is a feminine form of John, an Anglicisation of Old French Jehanne. Although in use since the Middle Ages, it only became the standard form in the 17th century after being taken up by the aristocracy; until then, Joan was the more common name. Plain Jane is 20th century slang for an average or ordinary looking woman, which must have irritated many a Jane over the years. Jane peaked in the 1960s at #33, was out of the Top 100 by the 1990s, and quite recently dropped off the rankings altogether. Its real success is probably as a middle name. 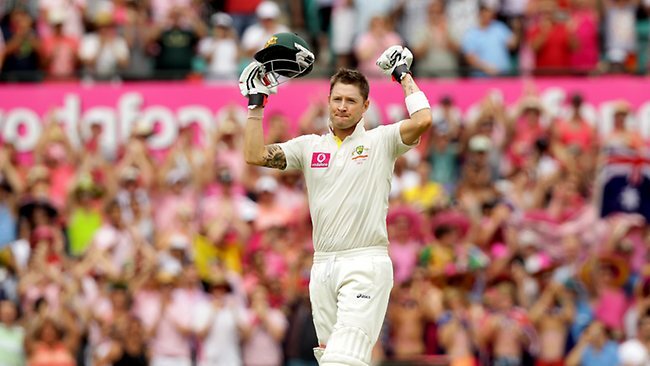 Note: Michael Clarke later gained sponsorship by a little-known sporting goods company from Wollongong named Spartan.